Our New Year’s Eve tradition on Mount Persis had been put on hold the last two years due to road closures. Unsure when (or if) the roads will ever be open again, I’ve directed my attention to another one of my favorite solitude snow scrambles in the Snow Lake Basin area. Snoqualmie area forecast 50% chance snow after 10 AM forced me to start earlier than usual, plus I needed to get back into town in the afternoon. Pups and I left the empty Alpental lot at 7 AM while it was still dark. Once again, thanks to recent foot traffic, snow on trail was more packed than anticipated, used just microspikes for traction. 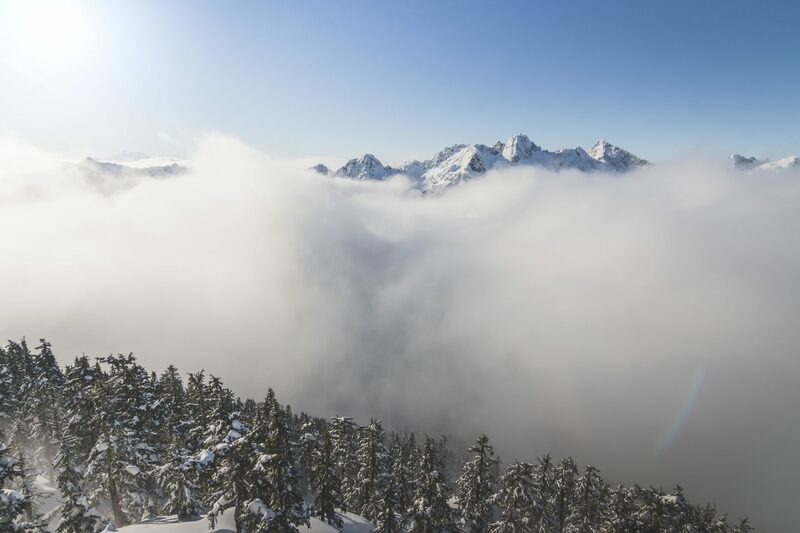 Peaks around South Fork Snoqualmie River Basin slowly became visible as morning clouds settled. Snow got softer as we approached Source Lake Trail, and I put on snowshoes at the junction. No recent snowshoe tracks were spotted after taking the hairpin turn, but lots postholing boot tracks. Near end of the first long switchback boot tracks slowly disappeared into recent avalanche debris. I headed straight and broke trail for a while until I noticed a set of day-old snowshoe tracks coming from the east heading uphill 10-15 feet above me. At that point I took a turn heading west through more soft snow and joined the tracks just before getting through area below the icy cliffs. Tracks took some shortcuts getting up to the pass, which worked out much better than long drawn switchbacks. At the pass where summer trail normally took a turn westward switchbacked down to the lake, we traveled northeastward into the basin east of Snow Lake. Avalanche Mountain wasn’t visible until after heading farther up the drainage. Getting through fresh powder wasn’t too bad in lower basin until we approached bottom of Avalanche Mountain’s steep west slopes. This was the most snow I’ve seen in past three years, mostly knee to thigh deep. It took a long while getting up to the south ridge at 5,000′, mostly because we were sliding with every step. More semi-packed snow on ridge crest allowed for a faster traverse. Occasionally we would drop down west slopes to get around places where boulders normally were. Views began to open up on the ridge, and Snoqualmie Mountain looked daunting from the north side. Cold temperatures weren’t too bad with the sun being out. As we got near the summit, temperature inversions in nearby valleys and basins began to rise. Clouds generally stayed low in years past, but for some reason this year they decided to rise. On the summit we got about five minutes of views to the east and south before area was overtaken by fast rising clouds. Within a matter of seconds temperatures went from lukewarm to sub zero; wind picked up as well. Pups and I didn’t stay long after clouds swarmed in, left the summit right after taking our summit shot. Getting from west slopes back down into the basin took a fraction of the time it took us to get up. From the basin we traced our steps back to the pass and down Snow Lake Trail back to the car.